The University of Minnesota, Morris is hosting their 32nd Annual Contest powwow. Grand Entry at 1 and 7 pm. Feast, American Indian arts and crafts. Drum split (first 10 drums only). MC: Jerry Dearly. Host Drum: Wahpekute. AD: Gabe Desrosiers. Head Dance Judge: Michael Gabbard. Honor Guard: Lakota Woman Warriors. Dance contest categories include: Golden Age (55+ men/women) combined; Adult Men (18–54 years) Traditional, Grass, Fancy; Adult Women (18–54 years) Traditional, Jingle, Fancy; Teen (12–17 years) Traditional, Grass, Fancy; Teen Girls’ Traditional, Jingle, Fancy; Junior (6–11 years) Traditional, Grass, Fancy; Junior Girls’ Traditional, Jingle, Fancy; and Tiny Tots (0–5 years). Specials include Potato and Street Dance. There also will be a drum payout for the first 10 drums (must have five registered singers). Free and open to the public. University of Minnesota, Morris, Physical Education Center, 626 East 2nd St., Morris, MN. Grand Entries 1 and 7 pm. Feast at 5 pm. AD: Ricky White. MC: Mickey Hodges. Honor Guard: Fon du Lac. Head Dancers: Naomi Pigeon and Joe Erler. Spiritual Advisor: Ron Leith. Host Drum: Red Tree. Invited Drum: Little Thunder and Timberland. Free. Main Gym, Hallenbeck Hall, St. Cloud State University, St. Cloud, MN. For info, call 320-308-4706 or email: aic@stcloudstate.edu. SCSU Everybody is welcome to attend! For vendor applications, email aic@stcloudstate.edu. 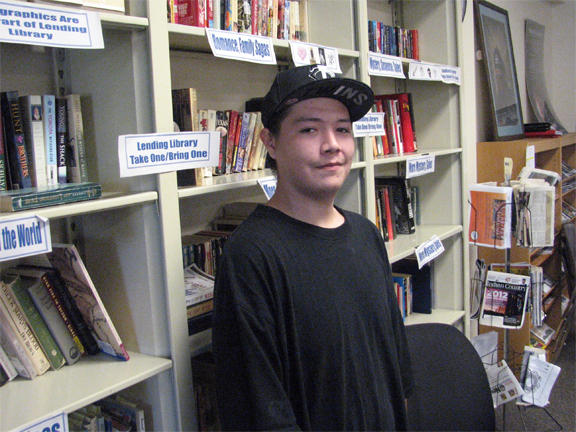 Head Man: Olin Yazzie. Head Lady: Iliana Bennett. MC: Joe Syrette. Host Drums: Young Buffalo Horse & Smokeytown. Midnight Smokedance Special. 223 Kalamazoo St East Lansing, MI. For info, contact: Ashley Ryerse at 517-355-9710 or ryerseas@gmail.com. UW-Madison, Madison, WI. For info, contact 608-265-3420. Saturday, April 9: 11:00 am doors open; 1:00 pm Grand Entry; 4:00 pm break; 6:00 pm Grand Entry. Sunday, April 10: 11:00 am doors open; 12:00 pm Grand Entry; 4:00 pm powwow ends. Specials: Hand Drum Competition, Two Step Competition, Silent Auction, Cake Walk. Free and open to the public. GVSU Fieldhouse, 10915 S. Campus Dr., Allendale, MI. For info call, Office of Multicultural Affairs at 616-331-2177 or email: oma@gvsu.edu. MC: Murphy Thomas & Branden Bowstring. Spiritual Leaders: Darrell Kingbird, Cody Goggleye. ADs: Pat Haugen and Royal Rock. Host Drum: LLTC Singers. Grand Entries on Saturday at 1 pm and 6:30 pm; and Sunday at 1 pm. Meal provided on Saturday at 5 pm and Sunday at 3 pm. First 15 Drums to Register. Must have 5+ singers. Dancers must be in full regalia. Free admission, open to the public. Cass Lake Bena High School, 15308 State Highway 371 NW, Cass Lake, MN. For info, contact David Northbird at 218-335-4222 or email: david.northbird@lltc.edu. For vendor information call Flower Kingbird at 218-335-4224 or email: flowerkingbird@lltc.edu. Grand Entries: Friday, April 22 at 7 pm; Saturday, April 23 at1 pm and 7 pm; Sunday, April 24 at 1 pm. Traditional meal served Saturday, April 23 at 5 pm. Admission: UND students free with current ID; $13 for weekend or $8 per day; 60+ and 5 and under are free. Contest categories: Golden Age Men and Women (60+); Senior Adult Men and Women (35-59); Junior Adult Men & Women (18-34); Teen Boys & Girls (13-17); Junior Boys & Girls (6-12); Tiny Tots (0-5). Singing Contest (1st-4th). University of North Dakota, Hyslop Sports Center, 2751 2nd Avenue, Grand Forks, ND. For info, contact Indian Studies Dept. at 701-777-4650 or email: feather.tapio@und.edu. MC/Spiritual Advisor: Darrell Kingbird. Co-MC: Dave Northbird. ADs: Earl Fairbanks and Pat Haugen. Host Drum: Youngkingbird. Dancer and Drum registration: 10 am – 2 pm. Grand Entries: 1 pm and 7 pm. Drums: 5 singers minimum. Hand Drum, Jingle, Grass, Men’s Traditional & Women’s Fancy Contest: $300, $200, & $100. Sanford Center, 111 Event Center Drive NE, Bemidji, MN. For info, contact Darryl Northbird: 218-335-4457. MC: Artley Skenandore. AD: Brian Jackson. Co-Host Drums: Tomahawk Circle Singers and Northern Wind. Invited Drums: Wind Eagle, Grindstone Lake Singers, Ho-Chunk Station, Picture Rock Singers, Old 54. Head Dancers: Brevin Boyd and Rose Sanapaw. Head Veteran: Paul Cloud. Color Guard: Lac du Flambeau. Doors open at 11 am. Grand Entries at 1 and 7 pm. Feast 5 pm. Madison College, Redsten Gymnasium, Truax Campus, 1701 Wright St., Madison, WI. Admission: $5 includes feast and all powwow activities; Elders (55 and older), children 5 & under are free. For info, call 608-246-6458. Minot State University Dome, Minot, ND. For info, contact 701-858-3365. MC: Jerry Dearly. Host Drums: Red Bone. Grand Entries: 1 pm and 7 pm. Feast is at 5 pm with $5 dinner ticket (Feast free for elders 65+, children 5 and under, and UMN students with valid Student ID). University of Minnesota Fiedhouse, 1800 University Avenue SE, Minneapolis, MN. For info, contact Randy Gresczyk at 612-624-0243 or email: aiscc@umn.edu. UW-Stevens Point-Berg Gym, Stevens Point, WI. For info, call 715-346-3576. MCs: James Cross and Robert Jones. ADs: Miziway DesJarlait and Mike Demo. Head Man: Robert DesJarlait. Head Woman: Linda EagleSpeaker. Host Drums: Little Earth and Red Bone. Little Earth Princess, Brave Royalty, Baby Space Princess and Brave Royalty at 3:00 pm. Hand Drum Contest for groups of 3 or more at 5 pm with winners announced at 9 pm. 1st place $300, 2nd: $200, 3rd $100. From noon to 9 pm. Grand Entry at 1 and 7 pm. Feast and Tatanka Truck at 5 pm. Little Earth of United Tribes, 2495 18th Ave. S., Minneapolis. For info, call James at 651-329-9389. Powwow for Hope "Dancing for Life, Love & Hope" is a community event and fundraiser for the American Indian Cancer Foundation. It is an opportunity for you to offer your love and support to the cancer survivors and caregivers in our community, to honor loved ones who have passed on, and to learn more about cancer prevention and resources. 9 am to 10:30 pm. Bass Camp Facility, 201 Bloomington Road, Fort Snelling, Minneapolis, MN. For info, call 612-314-4848 or see: www.americanindiancancer.org. Woodland Bowl, Keshena, WI. For info, call 715-851-4748. Veterans Memorial Grounds, Palace Casino Drive, Cass Lake, MN. For info, contact Rod Northbird at 218-308-3120 or rod.northbird@ nwioic.org. Or Leah Gale Monroe at 218-760-3127 or leahgale@ hotmail.com. 7 Clans Casino, Thief River Falls, MN. For info, call 218-556-7566. Honoring our veterans’ past and present. Sponsored by AMVets Post 53 & Ladies Auxillary. Noon – 5 pm. Mille Lacs Indian Museum and Trading Post, 43411 Oodena Dr., Onamia, MN. For info, call 320-532-3632 or see http://www.mnhs.org/event/1290. Powwow, Walk/Run, Horseshoe Tournament. Pow-wow Grounds, S-Lake, MN. (28 mi. N of Deer River MN 56681 on Hwy 46). For info, call 218-760-7955 (Gary) or 218-308-3680 (LaVonne). Fort Randall Casino, Pickstown, SD. For info, call 605-487-7871 ext. 473. Norbert Hill Center, Oneida, WI. For info, call 920-496-5311 or 800-236-2214. Veterans Memorial Grounds (located next to Palace Casino on Palace Casino Drive), Cass Lake, MN. For info, call LaVonne Thompson at 218-308-3680 or lavonne.thompson@leechlakegaming.com. Pow-wow Gorunds, Red Cliff, WI. For info, call 715-779-3700. Rosebud Casino, Rosebud, SD. For info, call 800-786-7673. Traditional Powwow with some dance and drum specials. No Admission Fees, Native vendors only. Camping: On-site camping, some electricity hookups available, bathrooms with showers. Call ahead to reserve a room at the Little River Casino Resort located across the street from the Powwow Grounds Toll-Free: 1-888-568-2244. 2608 Government Center Drive, Manistee, MI. For info, call Kareen Lewis 231-398-6895 or email: KareenLewis@lrboi-nsn.gov. Grand entries: July 8 at 7 pm; July 9 at 1 pm and 7 pm; July 10 at 1 pm. Contest categories: Teen Girls Jingle Dress – 1st place $600, 2nd place $400, 3rd place $200; Women’s Fancy Shawl – 1st place $500, 2nd place $400, 3rd place $300; Teen Girls Fancy Shawl – 1st place $300, 2nd place $200, 3rd place $100; Sybling Special Boys and Girls; Teen Girls Fancy Shawl; Men’s Fancy Dance 18+ (Note: Man Bells needed, five on each side, old style) – 1st place $1,000, 2nd place $800, 3rd place $600, 4th place $400; Men’s Grass Dance; Cowboy Hat/Boot Special; Moccasin Game Tournament (held all weekend); Women’s Crow Style; Men’s Crow Style; Women’s Backup Singing Contest. Tiny tots (up to age 5) get day money. 5636 Stugeon Road, Prairie Island, MN. For info, call 651-267-4024 or 651-385-4161, or see: www.facebook.com/PIICWacipiPowWow. LCO Pow-wow Grounds, Hayward, WI. For info, call 715-634-8934. 54th Annual Traditional Powwow. 6 mi. W of Deer Diver MN on US 2, Ball Club, MN. For info, contact Rose Wilson at 218-398-2893 or rosewilson133@yahoo.com. Andrew Shaw, Sr. Arena, Fort Totten, ND. For info, call 701-381-9753. 13 mi. E of Walker Mn. on Co. Rd.13, Onigum, MN. For info, call Theresa Jordan at 218-536-0213. Upper Sioux Community powwow. Warm-Ups: Friday, 7 pm. Grand Entries: Saturday 1 pm and 7 pm; and Sunday 1 pm. Vendor Deadline is July 8, contact Eric 320-564-6057. For info, call 320-564-6040 or 320-564-6057. Upper Sioux Community, 5722 Travers Lane, Granite Falls, MN. Many Trails Park, Bowler, WI. For info, call 715-793-4111. Music, dancing, craft demonstrations, and hands-on workshops will be held at the Grand Portage National Monument Rendezvous Program. The Stockade, reconstructed buildings and historic encampment are open from 9 am – 5 pm. 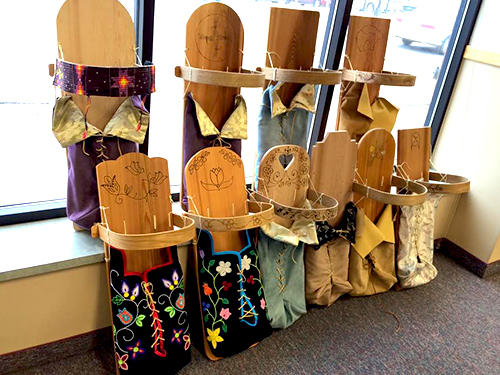 The event is held in conjunction with the annual Grand Portage Powwow, an American Indian cultural gathering focusing on dance, song and family celebration. Admission is free. Everyone is invited to watch and participate in the powwow. Free. National Monument Heritage Center, 170 Mile Creek Rd., Grand Portage, MN. For info, see: www.visitcookcounty.com/ entry/?id=3738. 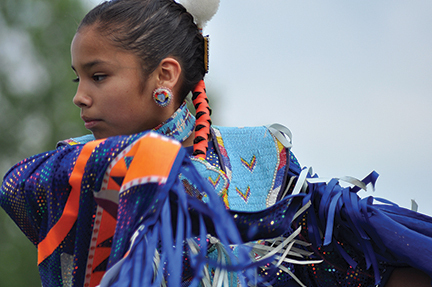 Dancers of all ages will gather at the annual Shakopee Mdewakanton Sioux Community Wacipi. Flag Raising: Saturday and Sunday at 9 am. Grand Entry: Friday at 7 pm., Saturday at 1 pm. and 7 pm., Sunday at 1 pm. $10 for entire weekend with button purchase. Adults 60+ are free. Children 10 and under are free. 2016-2017 Wacipi Grounds, 3212 Dakotah Parkway, Shakopee, MN. Directions: north of Mystic Lake Casino Hotel and south of County Road 42, between county roads 83 and 17 (Marschall Road). Ample parking: golf carts are available at no charge to transport guests from the parking lot to the grounds. For info, call 952-445-8900 or see: http://smscwacipi.org. Shaw Bosh Kung Pt., Onamia, MN. Directions: West side of Mille Lacs Lake, 12 miles North of Onamia on Hwy 169, follow signs. For info, call 612-440-6526. 36th Annual Traditional Pow Wow, Inger, MN. For info, call Dorothy at 218-556-7590. Labor Day Contest Powwow at the Leech Lake Veterans Grounds, located next to the Palace Casino on Palace Drive. Cass Lake. For info, contact Rod Northbird at 218-308-3120 or rod.northbird@nwioic.org. Or Leah Gale Monroe at 218-760-3127 or leahgale@hotmail.com. Mendota Heights, Mendota, MN (Highway 13 & 110, by Mendota Bridge). For info, call Sharon Lennartson at 651-452-4141 or 612-913-1903. Cost: $5.00 donation, no one turned away. Henry Maier Festival Park, Milwaukee, WI. For info, call 414-604-1000. MCs: Jerry Dearly and Danny Seaboy. AD: Richard Milda. Host Drums: Mazakute Singers, Santee, NE and Oyate Teca, Pine Ridge, SD. Grand Entries: Friday at 7 pm; Saturday at 1 pm and 7 pm; Sunday at 1 pm. General Admission $7.00 for the entire weekend, Children 12 and under get in free, Seniors 60 and older: $5.00 Dakota Wakisue Makoce (Land of Memories Park), Mankato, MN. Directions: Coming from 169 heading south into Mankato: Cross over the Blue Earth River on 169/60 and proceed down the short incline. There is a sign on the right side of the road saying Land of Memories Campground with an arrow pointing to the right. Right hand turn lane and turn right. Then take the first left. Go up a small hill, over railroad tracks and into the campground. For info, call Dave Brave Heart at 507-514-5088 or Dan Zielske at 507-387-3572. Battle Point Pow Wow Grounds, Battle Point Drive, Federal Dam, MN. For info, call Leah Gale Monroe at 218-760-3127. St. Joseph’s Indian, School Football Field, Chamberlain, SD. For info, call 605-234-3313 or 605-234-3366.